Paul F. Carilli, 77, of Heritage Dr., Negaunee Township, passed away Sunday, February 17, 2019 at UP Health System Marquette in the care of his loving family. Paul was born August 6, 1941 in Ishpeming to Angelo and Aili (Rajala) Carilli and graduated from Negaunee High School, Class of 1959. 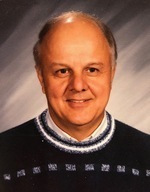 He continued his education at Northern Michigan University, earning a Bachelor of Science Degree in Education in 1963 and later his Master’s Degree. Paul was a dedicated teacher at Bothwell Middle School for 27 years, retiring in 1997. Mr. Carilli was a member of Immanuel Lutheran Church, Negaunee. Paul was passionate about classic cars, and loved to restore them in his garage. Surviving are his loving wife, Betty (Jarvela) Carilli; a son, Daniel (Linda) Carilli of Negaunee; a daughter, Debra (Ron) Polomoscanik of Farmington, MN; two grandchildren, Morgan Carilli and Kristi Anttila; two great-grandchildren, Violet and Joseph; and a brother, Daniel Carilli of Gwinn. He was preceded in death by his parents. Memorial services will be held at 12:00 noon on Monday, February 25th at Immanuel Lutheran Church, with Rev. Steven Solberg officiating. Interment will be in the Negaunee Cemetery. The family will greet relatives and friends for one hour prior to services at the church on Monday, and also for a light lunch and desserts in the church fellowship hall immediately following services. Mr. Carilli’s memorial page may be viewed at koskeyfuneralhome.com, where memories and condolences may be shared.